This story starts back in the early 1980’s. My friends and I wanted to start a band. So we set a time to meet at our drummers house for our first jam. I showed up with my five string banjo, but as soon as the drums, electric guitar and keyboard all started to play I couldn’t hear my self at all. The instrument my family was always complaining was to loud, had met its match against these electric instruments. Still, plenty of my time was dedicated to bluegrass bands and mountain jams. But that was the first time I asked myself “How would a banjo be amplified”? It was not until the mid 1990’s that for live performance reasons I found myself needing to amplify the banjo, and this time, for real. I tried every pickup I could find as well as every combination of pickups. Feedback was my biggest frustration next was poor tone followed by bleed through (other instruments coming though the pickup or microphone your using). In a desperate attempt I took an old electric guitar and strung it like a banjo. It worked alright for the next few performances but just sounded like an electric guitar strung like a banjo. 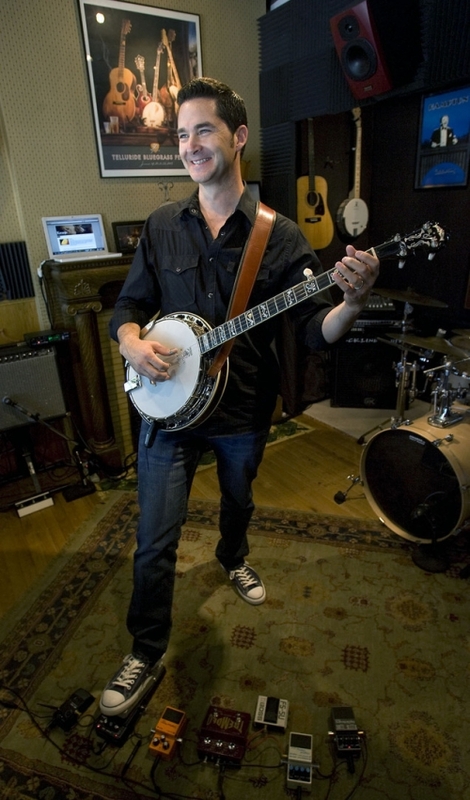 It did however get me thinking about a fresh approach to using an electromagnetic pickup on the banjo. For the next few years I tested out some theories on how to best extend though the banjo head. In one instance I used a soldering iron to create the hole, coterizing the mylar (plastic) as it went though. I brought the head up to full tension and it didn’t rip or tear! I knew I was on to something. I wanted to get the magnetic field and coils of the pickup as close to the stings as possible, the only way to achieve that was to go beyond the plane of the head. I researched how to wind my own pickups (only because there was no such thing as a five pole pickup on the market) and once I made my first working prototype my next priority was to protect my idea. In 2002 I applied for a ‘patent pending’ followed by the actual patent application in December of 2003. In the fall of 2006 I was awarded my US Patent! They granted me all of my claims, the most important in my mind, the sole right to make ‘one or a plurality’ of holes in the banjo head. This pickup system was originally conceived for those who want to run their banjo though a standard amplifier via their effect pedals or a processor unit. I’ve also heard it many times through a preamp going directly into a large PA system and it sounded great as well!